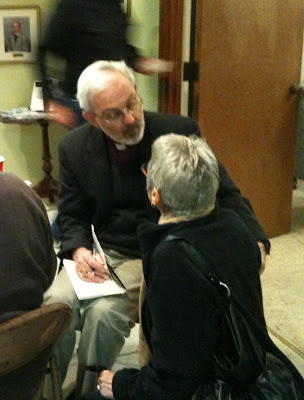 Rose gets her copy of the Bishop's book, Connecting the Dots, signed by the author. Our first Lenten Eucharist and Supper was held at St. Thomas' Episcopal Church on Wednesday night. Bishop Jake gave a wonderful sermon and the folks at St. Thomas' feed us well. Over ninety people from the Episcopal and Lutheran Churches in Monroe and West Monroe attended! The good people of St. Alban's really turned out...your rector was very proud!